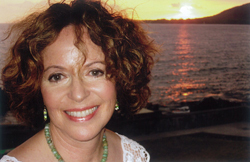 Belinda Farrell, author of the book Find Your Friggin’ Joy, graduated with a BA in Spanish and English from the University of California at Berkeley and is trained in hypnotherapy, past life regression, NLP, Hawaiian chanting, and ancient Hawaiian healing (Huna). Belinda trained with Anthony Robbins (author of Unlimited Power) and has effectively used these skills in her own life. She has completed 18 firewalks. When Belinda was forty-eight, she collapsed with herniated discs and spinal nerve damage. Threatened with paralysis by her medical doctors if she didn’t have surgery, Belinda instead chose to apply the ancient Hawaiian healing practices she had been learning the previous three years, which are covered in this book. Her back completely healed, including childhood scoliosis. For fifteen years she has been sharing these healing practices with others, offering Reconnective Healing and Huna classes and taking clients to Hawaii to teach Huna and swim with wild spinner dolphins.